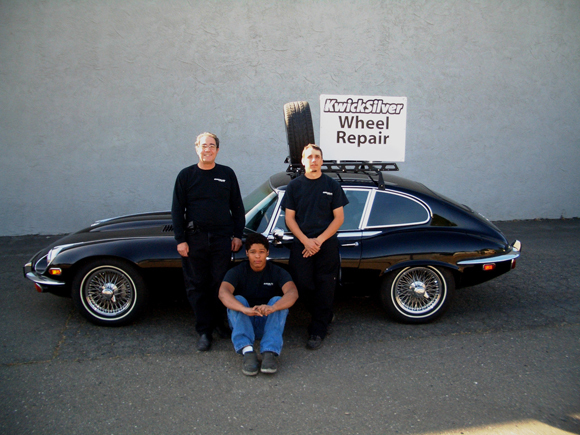 We are your Northern California Kwicksilver team and we have a lifetime passion for cars, wheels and service. We love what we do and it shows. Kwicksilver is the leading authority when it comes to wheel repair. We take pride in constantly developing new equipment and tools that give us a decided advantage over the competition. Our newly redesigned Kwickshop™ repair facility is an example of our commitment to innovation. This is a fully equipped repair shop, customized specifically for wheel maintenance and repair. The Kwickshop includes a dual assist arm tire changer, capable of changing the most popular alloy and custom wheels. We also have computerized wheel balancer and professional paint booth that is EPA compliant. There are Kwickspin machines in the prep and paint areas. It’s time for you to experience the most convenient, cutting edge wheel service available today. Please browse our available services and contact our professional staff today to schedule an appointment. Body shop managers will eliminate last minute problems often caused by using out of town wheel replacement companies. Your Kwicksilver pro is local to your community, and in most cases can provide same day service. Wheels can be dropped off at our Kwicksilver shop and delivered back to you, often within 24 hours. No more calling around to see who has the OE replacement you are looking for. Kwicksilver can also repair aftermarket rims that are not stocked by your current vendor. The appearance of a car’s wheels can greatly influence a prospective buyer’s overall interest in the car and his willingness to pay top dollar for a pre-owned vehicle. Curb rash, scrapes, gouges and discoloration can all decrease the value and appeal of a car. With our patented machinery and proprietary system of repair, we guarantee expert results. We’ll even walk the lot for you to identify those wheels that require repair and provide you with a free estimate for the work. Email us today for more information, a cost estimate for your repair and to schedule an appointment or discuss your wheels.